There are lots of questions about acorns on the oak trees this year. They have been really annoying to me, especially at night. Acorns falling on the metal car are not good for sleeping. The most common questions are: 1) Are the acorns toxic in any way to animals, people or the soil, 2) Why are there so many acorns this year, and 3) What should I do with them? Acorns can be somewhat toxic, but livestock, pets or humans would have to eat a large quantity of them to cause poisoning. That is unlikely because of the taste. Cattle are sometimes at risk in drought time when adequate forage is not available. 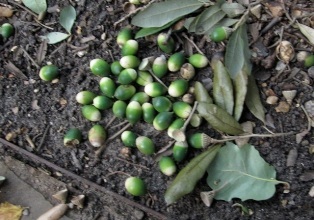 Acorns are not damaging to the soil, just a nuisance when the little trees start growing. In general, excessive fruit production on trees and shrubs usually means that the plants have been in some kind of stress and are overdoing seed production in an attempt to grow more plants to protect their genetics. Common culprits causing stress are too much or too little water, over fertilization, soil compaction, etc. This year, it has probably been the excessive summer heat and heavy rains. It could mean that a harsh winter is in store, but the old timers are predicting a warm dry winter. Don't bet any money on it however. There are three methods for handling the oak seeds once they are on the ground. First, pick them up and plant them in order to start your own tree farm. Do it quickly before the weevils get them. Here's how to do it. First, toss the acorns in water. Those that float are bad because they have already been attacked by insects or microbes and should be thrown in the compost pile. Those that sink should be planted by counter sinking them sideways into the potting soil so that ½ of the acorns will still be showing above the soil. With water and warmth, the acorns should sprout within a few weeks. The best potting soil is a mixture of compost, zeolite and coconut fiber. The second approach is to rake or shopvac them up and remove them to the compost pile. They make an excellent protein ingredient for the compost. To speed up the compost process, drive over them with your car in the driveway before putting them in the compost pile. The crushed acorns should be mixed with leaves and other organic material. They are high in protein and other nutrients. The final approach is to let them all stay right where they are. Most will be attacked by insects and microorganisms and rot on the surface of the ground. Squirrels in most cases will have planted the most viable ones and they will soon become trees. Squirrels seem to be forgetful about where they bury things. As a final word, I am sorry but there is nothing that can be done to treat the trees or the soil to keep the acorn population down next year. What you get is what you get.